The link that brought you to this page and the page title are a bit of a misnomer, because this short report is not long enough to cover so many chapters of the Bible. What the link and the title do, however, is track where we are in our plan to read through the entire Bible in 1 year. May each report pique your interest and help you to draw near to God. The Bible, James 4:8, tells us if we do so God will draw near to us. 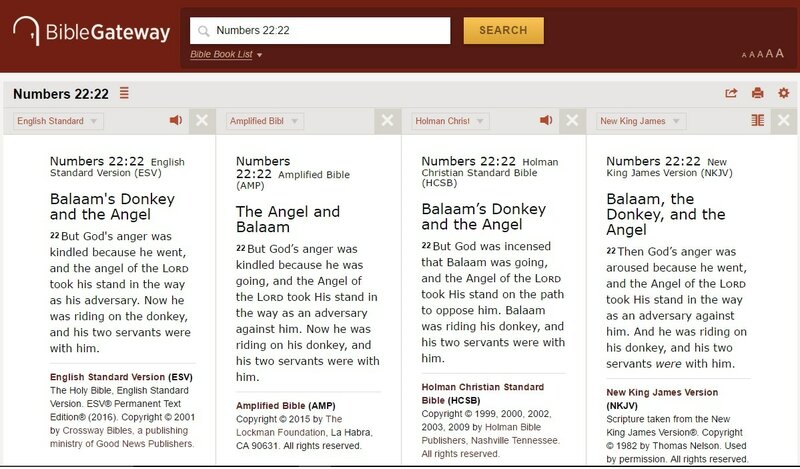 Works cited are at the end of the report and a screenshot of the ESV alongside the AMP, HSCB and NKJV showing the use of "Angel" follows. Internal links provide additional information. BIBLE READING—8TH WEEK—NUMBERS 18 - 34: Last week’s Short Report briefly considered some of the reasons we find hope in the book of Numbers and then turned to the sixth chapter to focus on the Nazirite Vow and the Priestly Blessing. Although this section of Numbers has many interesting facts, this week’s Short Report’s sole focus is on chapters 22, 23, and 24 that give us the account of Balaam and his donkey, and a certain “angel of the LORD” (Numbers 22:22). Also, in my closing paragraph I’ll discuss the ways Christ is covered in Balaam’s oracles. The Bible gives us many supernatural accounts of God interacting with mankind and effecting history to ensure the outcome is the one God wants—the salvation of His holy people. The story of Balaam and his donkey is an account that stands out, gets our attention, and reminds us that all things are possible with God (Luke 1:37; 18:27). Balaam was from Pethor, “a place on the western shore of the Euphrates River in northern Mesopotamia” (Eerdmans, 822). He was the son of Beor, who the Bible does not give us any information about. We do, however, receive additional insight about Balaam from the New Testament. 2 Peter 2:15-16 tells us he “loved the wages of unrighteousness but received a rebuke for his transgression: A donkey that could not talk spoke with a human voice and restrained the prophet’s irrationality.” While Peter calls Balaam a prophet, in context, he is speaking about false prophets, which also fits the context in the book of Numbers because the leaders of Moab and Midian left their homeland and went to Pethor prepared to pay Balaam the wages for divination (Num 22:7). I don’t want to appear to be giving Balaam too much credit. Even the demons may call the Lord by name (Acts 19:15), but they are not His, nor is He theirs. In Numbers – People’s Bible Commentary we are told as much when Kuske says, “Since he used the proper name, “LORD,” some people have assumed that he was a prophet of the true God. More likely Balaam considered the Lord no more than one of many gods” (pp. 174-75). All English Bibles I know of transliterate the Tetragrammaton, “the Hebrew name of God transliterated in four letters as YHWH or JHVH and articulated as Yahweh or Jehovah” (Wikipedia), as “LORD” (four uppercase letters). So, Balaam’s offense was especially egregious because he knew who Yahweh was, but had “forsaken the right way and gone astray” (2 Pet 2:15). You’ll remember from our reading that King Balak of Moab sent envoys to Balaam at Pethor because Israel was camped in the plains of Moab, across the Jordan River from Jericho. He felt they would attack and devour Moab so he sent for Balaam to curse the people of God. Balaam told Balak’s representatives to stay the night while he sought the Lord for an answer. God told Balaam, “You shall not go with them. You shall not curse the people, for they are blessed” (Numbers 22:12). As a result King Balak sent more emissaries to persuade Balaam, who again asked the leaders sent by the king to stay the night while he looked to God for His answer. God told Balaam to travel to the king with his representatives, but to follow His instructions (v. 20). On the way to Moab Balaam has a little trouble with his donkey, not once but three times as “the angel of the LORD” (Num 22:22, ESV) stood in his path to warn him. I point out the ESV, and also include the NIV version, because they use the lowercase “a” in angel, and so I can contrast them to the AMP, HCSB, and the NKJV which use the uppercase “A” that greatly affect the meaning of the passage to express an epiphany of Christ--the Angel of the LORD! Therefore Christ Himself stood on the trail three times to get Balaam’s attention, for his path was a “reckless one before [the Lord]” (v. 32). But only Balaam’s donkey perceived its Creator was standing before them with a drawn sword until, of course, the Lord also opened Balaam’s eyes. After that, Balaam was told, “Go with the men, but speak only the word that I tell you” (v. 35). There is a link between verses 20 and 35 where God on the one hand and the Angel of the Lord on the other give Balaam a similar command of obedience. One can determine They spoke with one voice. Kuske agrees saying, “We must conclude that the Angel is the second person of the Trinity” (p. 179). In his first oracle, Balaam alludes to the patriarchal promise (Num 23:10; cf. Gen 13:16; 28:24), which included the messianic promise. The second oracle is about Israel’s king (Num 23:21; cf. 17:6, 16; 35:11), and Balaam refers to the messianic lion of Judah from Jacob’s prophecy (Num 23:24; cf. Gen 49:9; Amos 1:2; Rev 5:5). In his third oracle, he speaks of the greatness of the messianic king (Num 24:7) and connects the messianic lion of Judah to the promise to the patriarchs (Num 24:9; cf. Gen 12:3; and 49:9). Balaam’s final oracle speaks directly of the Messiah as ‘not near’ (Num 24:17). When he arrives, however, he will be a star from Jacob (cf. Matt 2:2; Rev 22:16) and have a royal scepter (cf. Gen 49:10). He will also defeat Israel’s enemies (cf. Gen 49:9; Rev 19:11-21). A last thought, what happened to Balaam? In chapter 31 God had Israel take vengeance on the Midianites. During their battle Israel “killed Balaam the son of Beor with the sword” (Num 31:8). Kuske, Paul, W., Numbers – People’s Bible Commentary. ​Concordia Publishing House, 1996. Wikipedia, the free encyclopedia, Tetragrammaton​. Web. 21 February, 2017.